Is the truth out there? Edgar Mitchell once a man on the moon. I grew up in a time of wonder and was fortunate to have been encouraged by my parents to be an avid reader. Circumstances and some childhood events meant that I did spend a lot of time alone in my bedroom immersed in comics and the tales of Superman and the Green Lantern. But I also became an avid science fiction fan and devoured Asimov, Heinlein, Bradbury, Pohl and Clements, indeed I haunted the shelves of the local library looking for the bright yellow spines which like a beacon showed me wondrous tales from the publisher Gollancz. On the wall so me bedroom were drawings I ad done of superheroes and in pride of place on one wall was a map of the solar system showing the then 9 planets and their comparative sizes. There was no doubt in that young boys mind that aliens did exist and that one day he may be riding a rocket to Mars and encountering strange people in strange faraway lands. And now as a person on the older side of 50, who has been jaded and cynical I find that my belief in life elsewhere in the universe still hasn’t changed even if we didn’t reach the goal of my childhood of living on another planet by the time I was thirty. And that is why I place some credence in what some people say about the possibility of life other than on Earth. 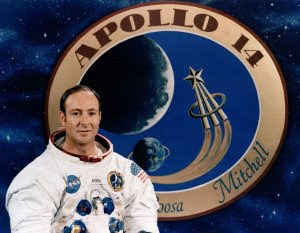 In the news today is former astronaut Edgar Mitchell who is one of only 12 men to walk on the Moon. A respected and knowledgeable man he claimed yesterday in a National Press Club appearance in the US that man is not alone. Mitchell grew up in Roswell, the site of conspiracy theorists shangri la, where an alien aircraft allegedly crashed in the 1940’s leading to an ongoing cover up in the US. This has been a favourite subject of science fiction shows for decades, notably the X files and Roswell, and has been consistently denied by US Government Officials. Mitchell states that people from Roswell began to come to him and told him their version of the events from that night decades ago and that as a result he was given an interview with a Rear Admiral at the Pentagon. But enough of me prattling listen to him yourself and tell me whether you think he is credible or not. Here he is in an interview on the Larry King show on CNN. Mitchell has been talking about this for some time and in 2008 went on a UK program Kerrang Radio. There has been several follow ups on the US radio program Coast to Coast. I won’t overburden all of you with the rest of this story but if you wish to hear it all the links on youtube are here – Part 2, Part 3. For all those who believe the Roswell Coverup, there are an equal number who scoff at it. I believe that some people are more credible than others and Mitchell hasn’t claimed to have seen them himself, he simply claims to have been told about certain things by people he knew and trusted. That is not proof but it is a tale worth listening to because he seems to me to be a credible person. Let’s also remember that the UK Department of Defense has recently released it’s own UFO files and we can say that there have been a number of occurrences that are not explainable. So is there any concrete proof? No. But it is not a big stretch for me to believe that somewhere in the vastness of the universe there are other people gazing out at the stars and pondering the same questions we are. It is not a stretch for me to believe that over the at least 4 billion year life of the universe that somewhere life has evolved technology beyond what we currently have. So am I a believer? Of course, what about you?